Summary. Detection and resection of small neuroendocrine tumours (NET) is like finding a needle in a hay stack. Use of specific tracers such as 68Ga-DOTATOC in a PET/CT study has been proven to have a high sensitivity and specificity to cells expressing somatostatin-SSR receptors. The use of 99mTc-Octreotide to detect neuroendocrine tumours during surgery is an effective adjunct for therapy. We here present a clinical case of patient with NET where these modalities help in both diagnostic and therapeutic surgery. Neuroendocrine tumors (NET) are common GI tumors and their detection and resection is like finding a needle in a hay stack. Nuclear medicine is a potential imaging tool which can be used for both diagnostic and therapeutic purposes. Many imaging modalities used in the past have a low sensitivity for NET compared to 68Ga-DOTATOC . Computed tomography with contrast can detect only up to 30% of tumors with a size of 1–3 cm . Imaging techniques such as magnetic resonance imaging and computed tomography are not very adequate in detection of neuroendocrine tumours . Use of specific tracers such as 68Ga-DOTATOC in a PET/CT study has been proven to have a high sensitivity and specificity to cells expressing somatostatin receptors . The use of 99mTc-Octreotide to detect neuroendocrine tumors during surgery is an effective adjunct for therapy. We here present a clinical case where these modalities help in both diagnostic and therapeutic surgery. Case report. In June, 2008, a 54-year-old man was referred to us with the diagnosis of urothelial carcinoma of the bladder (transitional cell carcinoma). After clinical investigations and confirmation of the diagnosis, he underwent a laparoscopic resection of the urinary bladder and prostate gland together with dissection and clearance of pelvic lymph nodes. During follow-up, in January 2010, biopsy was done on a suspicious paracaval lymph node. Histology revealed it to be a lymph node metastases of NET which did not originate from the bladder. MRI, endoscopic ultrasound, esophago-gastro-duodenal endoscopy, and colonoscopy were performed, but no primary NET was found. Besides this, the tumor marker chromogramin-A was low. The patient was considered to have cancer of unknown primary. However, the resected lymph node presented an elevated number of somatostatin receptors which are typically found in NET. Hence, a PET/CT scan was performed with 68Ga-DOTATOC which is highly sensitive to SSR2-receptors. We found an increased uptake in paravertebral lymph node and in a small area located in the duodenum. We have successfully nailed down the primary tumor — but how could we help our surgical colleagues to resect the suspicious tumor? We decided with our surgical team to proceed with gamma radiation probe guided surgery (Fig. 1). 99mTc-Octreotide is also sensitive to SSR2 but emits gamma-rays instead of positrons as 68Ga. The gamma probe was effectively used to help us detecting radiation emitted by the tumor intraoperatively and provided real-time information to navigate for tumour localization . After surgical procedure the resected specimen was reported to be a 1.8 cm well-differentiated neuroendocrine (Fig. 2) carcinoma of the papilla limited to the duodenal wall and two peripancreatic lymph node metastases. Four months later on a follow-up 68Ga-DOTATOC PET/CT imaging showed no suspicious lesion (Fig. 1). Pathologic examination of the resected specimen confirmed as a 1.8 cm tumor of whitish cut surface and firm consistency, locating at the papilla (Fig. 2). The tumor was limited to the duodenal wall. Microscopically, the tumor consisted of solid and trabecular formations of medium sized epithelial cells, displaying only little pleomorphism (Fig. 2, a). The tumor cells displayed prominent nucleoli; the cytoplasm was pale eosinophilic and occasionally contained clear vacuoles. The mitotic activity was low (one mitotic figure in 10 high power fields) and the tumor did not show any areas of necrosis. 2 of 18 peripancreatic lymph nodes contained metastases. The resection margins of the surgical specimen were free of tumor confirming appropriate margin clearance. Immunohistochemically, the tumor cells expressed the neuroendocrine markers chromogranin A and synaptophysin (Fig. 2, b). The proliferative activity (Mib1) was below 2%. An expression of the hormones ACTH, glucagon, gastrin, insulin, somatostatin, serotonin, or pancreatic polypeptide was not detected. Only very few tumor cells displayed a weak membranous immunoreactivity for somatostatin receptor 2 (Fig. 2, c). 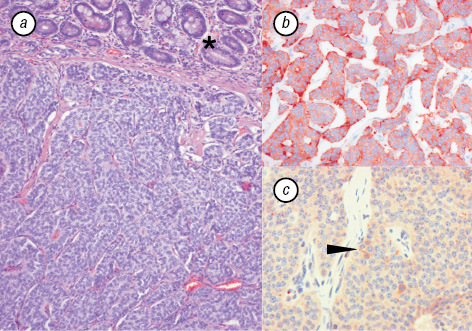 Based on these pathological findings, the diagnosis of a well-differentiated neuroendocrine carcinoma of the papilla was established. According to the re­commendations of the European Neuroendocrine Tumor Society  the tumor was classified as pT2, pN1(2/18), G1. Neuroendocrine tumors arise from hormone producing cells in the neuroendocrine system. They may originate anywhere in the body where there is neuroendocrine tissue. However, the location in the gastrointestinal tract is more likely because there are more neuroendocrine cells than anywhere else in the body. In early stages treatment of choice is surgical resection which subsequently results in a good prognosis. 1. Gabriel M, Decristoforo C, Kendler D, et al. 68Ga-DOTA-Tyr3-octreotide PET in neuroendocrine tumors: comparison with somatostatin receptor scintigraphy and CT. J Nucl Med 2007; 48: 508–18. 3. Jindal T, Kumar A, Venkitaraman B, et al. Role of 68Ga-DOTATOC PET/CT in the Evaluation of Primary Pulmonary Carcinoids. Korean J Intern Med 2010; 25: 386–91. 4. Jalilian A. 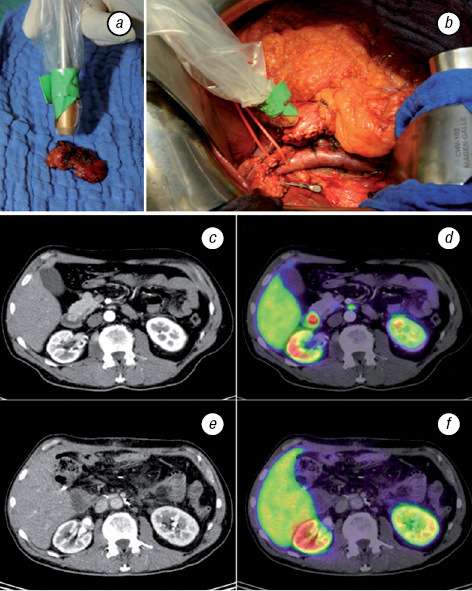 The application of unconventional PET tracers in nuclear medicine. Iran J Nucl Med 2009; 17: 1–11. 5. Strong VE, Galanis CJ, Riedl CC, et al. Portable PET probes are a novel tool for intraoperative localization of tumor deposits. Ann Surg Innov Res 2009; 3: 2. 6. Rindi G, Kloppel G, Alhman H, et al. TNM staging of foregut (neuro) endocrine tumors: a consensus proposal including a grading system. Virchows Arch 2006; 449: 395–401.